A sit bath, the traditional bathing method in many parts of the world, is also a space-saving alternative. Now fully redesigned, Century offers the best available sit bath with better features and options, and a new keyhole-shaped tub. • Many improvements have been made on the proven Century design. • A new panel provides better control over functions, and the new tub design offers improved immersion. • Therapy options include Hydromassage and Hydrosound. The complete Century concept includes integration with the height-adjustable lift hygiene chairs, Alenti or Calypso, to provide a complete solution for the bathing cycle. 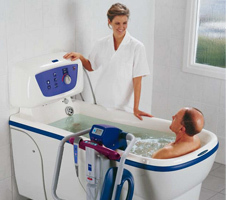 Century can enhance quality of life by improving the overall experience of sit bath sessions. Now easier to operate, Century also offers time-saving features such as Auto-fill. The new keyhole shape and the low rim height improve working conditions by enhancing access to the resident during bathing sessions. As well as providing a better sit bathing experience, the complete Century concept allows a single caregiver to manage the entire bathing cycle thus maximizing staff efficiency.